Even a novice thrifter can make there way to their local Goodwill or Value Village. Most people have seen these stores and they can be a lot like your average big box store in some fundamental ways - their stuff is divided in basically the same way, there is lots and lots of junk around and the employees have the same general malaise to them. All these things can make people feel at home. However some of the best deals around can be found at very small, hole-in-the-wall style charity thrift stores. These stores tend to have a very small selection of stuff only slightly organized and a very chatty grandmother type at the cash register. It is more like a garage sale than anything else. The two bibs below I found in Ballard at the Ryther Childcare Center's thrift store just off of Market. It is one of my favorite places because it seems to be so over looked. These two bibs cost 10 cents each. I also got a bag of toys (which my daughter did not need) for 50 cents. Here is my bet on this - the people who are pricing these things grew up in the depression. Because of this their idea of what a good deal is is rather thrifty. Anytime I can exit a thrift store for less then it costs to ride the bus there I think I have a found a pretty good deal. Its time for this weeks installment of Remembering a Past Good Deal (aka I need a post and haven't found anything recently). Decoration can run a rather shockingly expensive gamut, but luckily there is a multitude of fun and thrifty decorations available all over the place. (i.e. the ground, your dumpster, the back of the closet and even the thrift store) One particularly enjoyable decorative item for me is paint by number paintings. These retro-y items usually are full of bright, rich colors and of very picturesque little scenes such as prairies, ducks, snow falling on cedars, etc. I recently have had experience painting a paint by number and although enjoyable and even a little meditative they actually take a lot of work. Because of this I find it sad to see so many at the thrift store covered in dust. Above are two examples of nicely done paint by numbers that currently decorate our baby's room. Once you dust one of these little puppies off and throw them in an Ikea frame you are good to go. Plus people will think you are being postmodernly ironic, which helps develop hipster cred. My sister in law Stella has a mom who is either highly nostalgic or is thinking ahead. Whatever the case is I benefited from this personality trait recently. While down at her parents house with Stella we came across a box of kids stuff saved from way back when Stella and her brothers were little. It has some great toys, a collection of books and a couple flashy pieces of clothing such as the coat pictured above. Since these items were not being used I got to be the holder of them until a little Stella Jr is around to play with them. I think this coat is really the highlight of the bunch. It actually looks more stylish then retro on Hannah since this style is now back in stores. What goes around comes around I guess. For those of you who are wishing you could be enjoying some summer sun have I got an idea for you - stock up on sunblock now. I have become increasingly concerned about exposing myself and my family to chemicals so I have begun to buy natural cosmetics and organic produce as much as possible. This stuff can expensive though so good deals are always welcome. Anyway, last week while I was shopping at my natural grocery I checked out their sale table (as always) and found most of their sunblock was 50% off. Now I have heard that sunblock can lose its effectiveness, so in light of that I decided to stick with one tube for now. Hopefully my bargain will pay off. Yesterday my dear husband (DH for all you cyberfriends) was walking home from story time with Hannah (DD) when he spotted a box of free stuff outside of an apartment building. Now these boxes can really be hit or miss and it sounds like mostly this box was miss - just the regular selection of mismatched men's shoes and unidentifiable clothing. However DH was able to spot a blue fiestaware dinner plate among the junk. Fans will note that these are the plates we registered for at our wedding and the ones we use everyday. Even the color is a match. Tonight Dan, Hannah and I went to dinner at Baguette Box, a local high class sandwich shop. Although the food wasn't really a bargain we had a very nice cook/waiter who brought out a free meatball for Hannah and gave us some baguettes that they were going to throw out since we appeared to be the last customers of the night. Alas the meatball proved too spicy for Hannah, but luckily we were there to make sure it didn't go to waste. 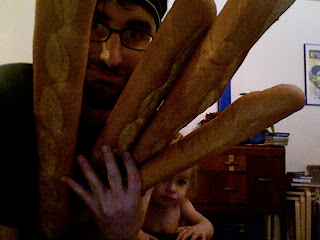 We were also there to take home a bag full of baguettes to freeze for sandwiches later. Lucky us! I have decided to rescind a previous post which stated that borax and baking soda make a good dishwasher detergent. I read this in a book about natural cleaning and it sounded good. It seemed to work ok the first couple of times as well. However after extensive and precise testing I have come to the decision that this is not a good deal at all. It does not clean the dishes. Please accept my sincere apologies for this crap suggestion. First off how cute is this sippy cup! We got this at Ikea for JJ when he was born and we picked up one for ourselves while we were there since it is just too cute. Well JJ's is gone. Sadly it melted in the dishwasher. Plus Ikea doesn't sell them anymore as far as I can tell which is why I was so excited to find one at Value Village in its original packaging for $.50. Now we have a back up in case ours bites the dust as well. It is definitely worth it since the other day I saw Hannah hugging her cup. No one wants to see that come to a premature end.